Lucky 8? 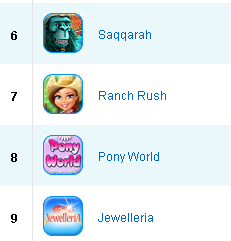 Pony World Deluxe in the iWin’s top 10 chart. Life is strange. When I least expected it, it happend. It did not happen with Tom’s Hen House. It did not happen with Runes of Avalon, though I was sooo sure it will make it (and not only I). It didn’t happen with Runes of Avalon 2, though I didn’t hope for it. And now, Pony World Deluxe made it. On the first day after release. It’s a great feeling to see your game in the top charts. A lot of portals is skeptical about Pony World performance due to choosen theme. Hopefully when they see how our game sells on iWin they will be much less skeptical. Don’t get your hopes up with iWin’s Top 10. Wait till when you get the sales report at the end of the month. @Bob: I don’t expect much, but if there is any correlation at all between iWin’s top 10 and other portals top 10’s then being in iWin top10 is a good sign for the future. At least it looks like there is a correlation according to CasualCharts.com.